Cho was brought to the world’s attention in Fall 2015 when he won the coveted Gold Medal at the Chopin International Competition in Warsaw. This same competition launched the careers of world-class artists such as ‎Martha Argerich, ‎Maurizio Pollini, Garrick Ohlsson and ‎Krystian Zimerman. Within one month, a recording of Cho’s live competition highlights was rush-released by Deutsche Grammophon, propelling the pianist to pop-star status in South Korea. The album achieved multi-platinum sales within a week of its release and triggered a sales frenzy at stores across the country. It reached No. 1 in the nation’s pop album chart and has sold well over 150,000 copies to date worldwide. In January 2016, following on the success of the debut disc, Cho signed an exclusive contract with Deutsche Grammophon. The first CD of this collaboration features Chopin’s First Concerto with the London Symphony Orchestra and Gianandrea Noseda and the Four Ballades, released to critical acclaim in November 2016. A solo Debussy album will be released in November 2017. Cho is an active recitalist and performs in many of the world’s most prestigious concert halls. In 2017, he made debuts at Carnegie Hall’s Keyboard Virtuosos series in a sold-out Stern Auditorium, Amsterdam’s Concertgebouw’s Master Pianists series, Tokyo’s Suntory Hall, Seoul’s new Lotte Hall, Paris’s new Seine Musicale, Edinburgh International Festival, Gstaad Menuhin Festival, KKL Lucerne and St. Petersburg’s Mariinsky Theatre. He collaborates with conductors at the highest level such as Valery Gergiev, Esa-Pekka Salonen, Gianandrea Noseda, Antonio Pappano, Myung-Whun Chung, Vladimir Ashkenazy, Yuri Temirkanov, Kzysztof Urbanski, Marek Janowski, Vasily Petrenko, Jakub Hrusa, Leonard Slatkin and Mikhail Pletnev. Orchestral appearances include the Royal Concertgebouw Orchestra, Orchestre de Paris, London Symphony Orchestra, Mariinsky Orchestra, Munich Philharmonic Orchestra, Rundfunk-Sinfonieorchester Berlin, Orchestre Philharmonique de Radio France, NHK Symphony Orchestra, Philharmonia Orchestra, Seoul Philharmonic Orchestra, Czech Philharmonic Orchestra, Budapest Festival Orchestra, Danish National Symphony Orchestra and Russian National Orchestra. Highlights of the 2017/18 and 2018/19 seasons include tours with the Orchestra dell'Accademia Nazionale di Santa Cecilia and Antonio Pappano, London Symphony Orchestra and Michael Tilson-Thomas, WDR Sinfonieorchester and Marek Janowski, and European Union Youth Orchestra and Gianandrea Noseda, with concerts at the BBC Proms, Berlin Konzerthaus and Amsterdam’s Concertgebouw. He makes appearances with the London Symphony Orchestra and National Symphony Orchestra both under Gianandrea Noseda’s baton, Detroit Symphony Orchestra with Leonard Slatkin, Frankfurt Radio Symphony with Andrès Orozco-Estrada, NDR Elbphilharmonie Orchester with Krzysztof Urbanski in Hamburg and Finnish Radio Orchestra with Hannu Lintu. He will play recitals in key venues like Munich’s Prinzregententheater, Stuttgart’s Liederhalle, Verbier Festival, Rheingau Festival, Heidelberger Frühling, La Roque d’Anthéron Festival and Baden Baden Festspielhaus. 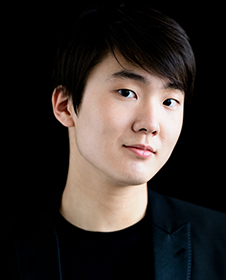 Born in 1994 in Seoul, Seong-Jin Cho started learning the piano at 6 and gave his first public recital at age 11. In 2009, he became the youngest-ever winner of Japan’s Hamamatsu International Piano Competition. In 2011, he won Third prize at the Tchaikovsky Competition in Moscow at the age of 17. In 2012, he moved to Paris to study with Michel Béroff at the Paris Conservatoire and he graduated in 2015. He is now based in Berlin.